Conventional machine vision systems use parameters such as size, colour and shape to search for defects or contaminants in the objects whose quality is to be checked. Systems that operate on the basis of hyperspectral imaging (HSI) take a different approach: they enable a spectroscopic analysis of the inspected materials to be carried out along with the coloured marking of the chemical composition of the substances. In this way both organic and inorganic contaminants can be detected with a single system. In the food industry, amongst others, this capability allows a wide range of possibilities to find contaminants in foodstuffs. Even in high-speed production lines, hyperspectral imaging systems identify foreign matter such as shell fragments or other substances in the production of nuts as well as stones or earth when sorting potatoes; they classify meat, fat and cartilage contents in meat production or identify substances that barely look any different to the human eye at first glance, such as sugar, salt and citric acid. Jelly beans - their different shapes and colours, but similar density, make it hard to identify them by conventional methods. Hyperspectral imaging reveals the jelly beans. "The range of applications for hyperspectral imaging is extremely varied," stresses Gerhard Stanzel, who specialises in this technology at STEMMER IMAGING and has helped numerous customers with the successful implementation of such systems in recent years. "Apart from the detection of foreign matter, the task in food production is often one of detecting rotten or unripe goods or goods infested by pests such as fungi. A further area of application in which this technology is very often used is the recycling of plastics. 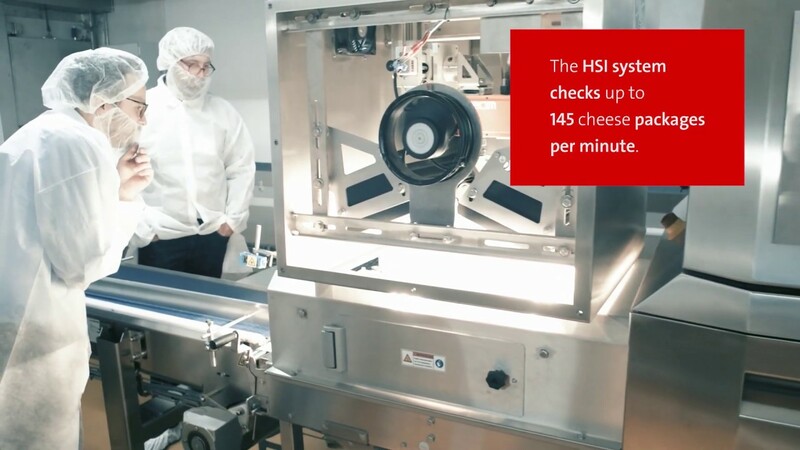 Apart from these two fields, however, there are many more areas of application, among others mining or the pharmaceutical industry, in which HSI systems could offer a cost-effective solution." Hyperspectral imaging mainly differs from image processing in the visible, UV or IR range in that more than 100 different wavelengths are frequently used for the analysis of the results. Depending on the technology in use, a spectrograph is required for this that splits the light into its spectrum and projects it onto the sensor of the camera. These images are then combined to form a three-dimensional data cube, which can contain very large quantities of data. In this way a "chemical fingerprint" of the pictured substance is created, allowing an exact analysis of the test objects. A special evaluation software thereby enables each chemical component in the captured image to be given its own colour marking. This allows even the different chemical compositions of substances that look very similar to be reliably detected and illustrated. Chemically identical substances in objects that look different can also be determined with the help of HSI systems. One aspect of this technology is particularly interesting for various applications of hyperspectral systems: infrared light can penetrate through certain substances that are non-transparent to visible light. This property can thus be used to check the chemical composition of packaged contents even through correspondingly designed packaging. As one example of a specific application from the food industry, Stanzel mentions the inspection of heat-sealed joints in cheese packaging at the cheese manufacturer Bergader: "Such heat-sealed joints ensure the absolutely airtight packaging of cheese or sausages. Even the tiniest contamination or damage can lead to leaking packaging and thus to the perishing of the foodstuffs before the calculated sell-by date. Possible consequences are unsaleable products or expensive recall actions." With the support of STEMMER IMAGING, Minebea Intec, a leading manufacturer of weighing and inspection solutions, implemented a heat-sealed joint inspection system for the cheese manufacturer Bergader that achieves almost 100% reliability in the detection of heat-sealed joint defects at a cycle speed of around 145 examinations per minute. This application employs an FX17 hyperspectral camera from the Finnish manufacturer Specim that was developed for the wavelength range from 900 to 1700 nm. The spectrograph used for the hyperspectral imaging is integrated directly into the housing of these compact cameras using a patented method, enabling an extremely small size of just 150 x 85 x 71 mm to be achieved. In addition, the lens in the FX cameras from Specim is optically matched to the spectrographs in order to achieve optimum results. STEMMER IMAGING's range of hyperspectral products encompasses much more, however, as Stanzel explains: "On the hardware side we cooperate with a number of manufacturers that have developed suitable lighting, lenses and cameras especially for use in HSI applications. With regard to the software, the intuitive user interface Perception Studio from the Graz-based company Perception Park enables users to develop and configure hyperspectral applications themselves without needing to have special knowledge of chemometry, spectroscopy or hyperspectral data processing." The performance of this software platform prompted STEMMER IMAGING in autumn 2018 to take a shareholding in this innovative company, which is regarded as a software pioneer in the field of hyperspectral imaging. With the intuitive user interface Perception Studio from Perception Park, users can develop and configure applications themselves without needing to have special knowledge of chemometry, spectroscopy or hyperspectral data processing. "On the basis of our range of hardware and software products for hyperspectral imaging as well as comprehensive support options, such as the carrying out of feasibility studies or special training, STEMMER IMAGING is able to offer hyperspectral systems that are precisely tailored to the respective application and to provide support for their implementation," says Stanzel, summing up. "Our customers thus find all the options here with which to create innovative solutions using this highly exciting technology." Hi, I'm Jörg Schmitz, one of the sales specialists for hyperspectral imaging at STEMMER IMAGING. Get in touch if you've got any questions on hyperspectral imaging and we'll try our best to help you out. Hi, I'm Gerhard Stanzel, one of the technical specialists for the hyperspectral technology at STEMMER IMAGING.